Singh P, Tufariello J, Wattam AR, Gillis TP, Jacobs Jr WR. 3 April 2018, posting date. Genomics insights into the biology and evolution of leprosy bacilli. In Scollard DM, Gillis TP (ed), International textbook of leprosy. www.internationaltextbookofleprosy.org. Leprosy is a chronic granulomatous disease that affects the peripheral nerves, skin, and eyes. It was strongly believed to be a hereditary disease until 1873, when a young Norwegian physician, Gerhard Armauer Hansen, demonstrated the causative bacterium of the disease. The pathogen, known as Mycobacterium leprae, has since defied all efforts to cultivate it in any artificial medium, thereby limiting traditional microbiological investigations. The availability of a very effective multi-drug therapy (MDT; see Chapter 2.6; Chapter 5.2) for over three decades has drastically reduced the prevalence of the disease; however, it has also facilitated the notion held by the general public and health policymakers that it is a disease of the past. This notion is clearly not the case, as new case detection rates of leprosy have stubbornly remained at or near 200,000 cases annually over the past decade . The persistent rate of new cases indicates that transmission has not been completely interrupted by MDT and that a fuller understanding of transmission (see Chapter 1.2) is required to fashion strategies aimed at reaching zero transmission of M. leprae and eventually eliminating leprosy. Genomics has contributed several important clues and molecular tools for sensitively and accurately detecting M. leprae, monitoring its transmission dynamics, and determining its susceptibility to anti-leprosy drugs. While attempts to cultivate M. leprae in vitro have been unproductive, Shepard’s report of limited multiplication of M. leprae in the foot pads of mice  (see Chapter 10.3) and Kirchheimer and Storrs’ subsequent successful experimental propagation of M. leprae in armadillos (see Chapter 10.2) in 1971 allowed the recovery of huge quantities of M. leprae  for in-depth study. Armadillos have proven to be an excellent animal model for leprosy, as leprosy in armadillos closely resembles leprosy in humans, including neurological involvement and the spectrum of immunological responses to infection , , , , . The availability of M. leprae purified from armadillo tissues enabled the construction of libraries for whole genome sequencing , . The first of these sequencing projects was completed using the M. leprae TN strain , which was originally isolated from a multibacillary (MB) patient from Tamil Nadu, India, and subsequently propagated in armadillos. The TN genome provided evidence that M. leprae exhibited exceptional reductive evolution, with a record number of pseudogenes in comparison with any known bacterium. Genomic analysis of M. leprae has explained why some drugs work against M. leprae and others do not based upon the presence or absence of their intact genomic/proteomic targets . Genomic analysis has also suggested some explanations for the extremely slow growth rate of M. leprae, which may be related to its very long incubation period prior to clinical disease. Finally, genomic analysis has provided possible explanations for past cultivation failures, as several key metabolic and stress-response proteins and enzymes either were missing or were present in the form of pseudogenes. Using these genomic insights, it has become possible to design more logical and informed experiments to improve our understanding of the unique biology and pathogenesis of M. leprae. Leprosy manifests a clinical (see Chapter 2.1; Chapter 2.4) and immunological (see Chapter 6.1; Chapter 6.2) spectrum. At one end of this spectrum are the tuberculoid leprosy (TT) cases with strong cell-mediated immunity (CMI) to M. leprae antigens, scanty or undetectable bacilli, and little to no antibodies to M. leprae antigens. The disease at the other end of the spectrum, referred to as lepromatous leprosy (LL), is characterized by numerous acid-fast bacilli and a strong antibody response to M. leprae antigens. There are also three borderline, often unstable, clinical forms (borderline lepromatous [BL], mid-borderline [BB], and borderline tuberculoid [BT]) of leprosy. Sudden changes in host immunity can cause inflammatory responses, collectively known as reactions. All of these clinical manifestations have been ascribed to host immunologic factors with little or no emphasis on the etiological agent’s virulence and pathogenesis. M. leprae strains from around the world present strikingly low levels of genetic diversity . However, the M. leprae strains that have been studied and characterized in detail have all been isolated from MB cases at the LL end of the spectrum. Whether pathological variants of M. leprae exist remains unknown, but their existence has been implied by the observation that certain M. leprae genotypes show frame-shift inactivation of the transcriptional regulator gene ML0825c . The ortholog of this regulator gene in M. tuberculosis rv2358 contributes to the zinc-dependent repression of several genes, including virulence-associated secretion system genes esxG and esxH , . Thus, further genomic investigations into the differential pathogenesis of various M. leprae strains and the adequate representation of M. leprae genotypes from the tuberculoid end of the disease spectrum may prove informative. In addition to the clinical presentations and reactions mentioned above, a particular form of leprosy known as diffuse lepromatous leprosy (DLL) has been described. Cases of DLL have been reported since 1852, primarily in Mexico and the Caribbean countries . DLL cases lack dermal nodules and are often characterized by the diffuse infiltration of skin by histiocytes and acid-fast bacilli, giving the skin a spotted appearance referred to as “pure and primitive diffuse lepromatosis (PPDL)”. Some of these cases develop acute skin reactions known as “erythema necroticans”, also called “Lucio’s Phenomenon” . Originally thought to be geographically restricted to Mexico, Costa Rica, and the Caribbean region, there have been reports of DLL in Singapore, Canada , , Brazil , , , India , , , Iran , Malaysia , and Myanmar . Such cases often involve diffuse mycobacterial invasion of endothelial cells surrounding small blood vessels, which leads to a progressive blockade of blood and oxygen supply. The blockade results in initially cyanotic lesions that gradually become necrotic (see Chapter 2.4). M. leprae has been considered the exclusive causative agent of all types of leprosy, including DLL and Lucio’s phenomenon. However, despite enormous numbers of acid-fast bacilli in DLL and Lucio’s phenomenon cases, some have been found to be negative for M. leprae DNA by PCR, creating confusion about the diagnosis and etiology of this condition. This confusion became evident upon identification of a new mycobacterial species, M. lepromatosis, in two Mexican patients with DLL . The samples were negative for the M. leprae-specific repetitive sequence, RLEP, indicating the absence of M. leprae. Cloning of a few selected genes (rpoB, 16S rDNA, gyrA, etc.) ,  from the bacteria present in infected tissues revealed that their sequences exhibited marked nucleotide differences (only ~90% sequence similarity) from corresponding M. leprae sequences. Phylogenetically, these sequences clustered tightly with those of M. leprae when compared to other mycobacterial species . The first independent confirmation of this species in a DLL case was reported in 2011 in an archived specimen from a Mexican patient from Monterrey. During drug resistance surveillance studies, the smear-positive sample was consistently found to be negative for M. leprae using RLEP, folP1, and gyrA templates. rpoB testing, however, produced a faintly positive reaction and DNA sequencing of the PCR product showed perfect alignment with the M. lepromatosis rpoB sequences  reported by Han et al. , . Recognition of this agent as a new species causing a leprosy-like condition remained unclear  due to both the limited pathological evidence available and the reports of coinfection with M. leprae in several cases . Subsequently, the DNA of M. lepromatosis was enriched (by removing human DNA using biotinylated baits and by capturing the pathogen DNA using probes spanning the M. leprae genome on an array) directly from a patient skin biopsy (coded as Mx1-22A). This enrichment enabled a genome-wide analysis of the bacterium, making it the first unsequenced mycobacterial genome to be deduced using this approach. The de novo assembly of these sequences yielded several contigs. Alignment of the M. lepromatosis genome assembly with the M. leprae TN genome showed near perfect colinearity and synteny with almost identical genome size, G+C content, and gene/pseudogene content. In spite of the similarities between M. leprae and M. lepromatosis, a deep evolutionary divergence is evident, supporting the claim that they are separate species. This conclusion stems from the fact that, in contrast to M. leprae isolates from around the world that exhibit only a few hundred SNPs (single nucleotide polymorphisms), the M. lepromatosis genome differs from the M. leprae strains at over a quarter of a million bases (i.e., >275,000 SNPs between M. leprae and M. lepromatosis). With a substitution rate of 7.67−9substitutions per site per year, the most recent common ancestor (TMRCA) for M. leprae and M. lepromatosis has been estimated to be 13.9 million years ago. Despite such a deep evolutionary divergence, both species share remarkable similarities in their biology and, in fact, remained indistinguishable for over a century. Though at present there is a paucity of well-described clinical presentations caused by M. lepromatosis, it is evident that it is not the sole cause of DLL or Lucio’s phenomenon. More detailed investigations using accurate and species-specific methods for studying the distribution of these two organisms and associated clinical presentation in a representative number of cases will therefore be informative. The most recent identification of an animal reservoir for M. lepromatosis was the red squirrel in Scotland . Subsequent investigations revealed the presence of M. leprae in England (Brownsea Island) and M. lepromatosis in Ireland and on the Isle of Wight in these animals . The whole genome comparison of the red squirrel-derived M. leprae strain exhibited striking similarity with the ancient M. leprae strain from a medieval England human leprosy skeleton . After the 16thcentury, leprosy cases declined in the UK and most of Europe and there have been almost no human leprosy cases identified there since. These observations underscore the significance of the possibility of additional animal reservoirs, even in countries where there have been almost no human cases for the past 3–4 centuries. Accordingly, the search for animal reservoirs needs to be encouraged, particularly in endemic countries where new case detection rates remain stubbornly high despite the implementation of effective chemotherapy. The M. leprae TN genome, sequenced in 2001 , was among the first genomes completed within the Mycobacterium genus, second only to M. tuberculosis H37Rv . Compared to the 4.4 Mb genome of M. tuberculosis, the M. leprae genome, at 3.26 Mb, presented extensive reductive evolution in terms of genome downsizing, loss of coding capacity, and accumulation of a record number of pseudogenes since the time of their divergence from a common ancestor . The M. lepromatosis Mx1-22A genome also exhibited remarkable similarities with the M. leprae genome in terms of genome downsizing and reductive evolution. Only half of the genome in M. leprae and in M. lepromatosis codes for functional genes (compared to over 90% in M. tuberculosis), while the rest mainly harbors pseudogenes and gene remnants whose intact counterparts are present in M. tuberculosis. As in M. leprae, the M. lepromatosis genome exhibits evidence of metabolic streamlining and loss of redundancy with shrinkage of all functional categories. All of these similarities point to the shared evolutionary history of M. leprae and M. lepromatosis. In addition, the displaced and inverted position of the prolyl tRNA synthetase gene (proS) in M. leprae and M. lepromatosis, in comparison to that of the prokaryotic type proS gene in M. tuberculosis, points to their eukaryotic origin through a recent horizontal transfer from a eukaryotic host . It is interesting that the proS gene of M. leprae and M. lepromatosis shows only a 27% amino acid identity with M. tuberculosis but a 44.5% amino acid identity with parts of the human proS gene. The M. haemophilum proS exhibits over 91% amino acid identity with the corresponding sequences in M. leprae and M. lepromatosis, and thus points to its acquisition from a eukaryotic source in M. haemophilum as well. A summary of the genome features of M. leprae and M. lepromatosis is presented in Table 1 and contrasted with other closely related mycobacterial pathogens. * Initial annotation reported 1116 pseudogenes. Upon the availability of other mycobacterial genomes for comparison, another 177 pseudogenes were subsequently identified . §The 3,206,741 bases are in the form of 126 contigs; later on another draft genome was also announced . ΨNone detected in the WGS project, though the possibility of low copy number plasmid is not fully ruled out. #pMM23 is a 23.317 kb plasmid and possesses 29 genes and a G+C content of 67.86 %. ##pMUM001 is a 174.155 kb plasmid and possesses 81 genes and a G+C content of 62.77%. Note: Due to different releases of various databases and genome (re)annotations, some of the features listed above may vary slightly in different sources. The M. lepromatosis gene and pseudogene content is strikingly similar to that in M. leprae (Table 1). This similarity points to a shared evolutionary history of reductive evolution. M. leprae and M. lepromatosis share 1349 CDS (coding sequences) and 1016 pseudogenes. In addition to this shared pool of CDS, M. leprae possesses an additional 132 CDS whose counterparts exist as pseudogenes in M. lepromatosis. However, a majority of them are annotated as conserved hypothetical proteins, with a few exceptions. The exceptions are ilvX, proA, cysE, and cysK, all of which are required for amino acid biosynthesis in M. leprae, implying that M. lepromatosis might be relatively more constrained in these processes than M. leprae. On the other hand, 26 genes present in M. lepromatosis have been found as pseudogenes in M. leprae. However, most of this contrasting genomic content (sequences which are annotated as CDS in one species but as a pseudogene in the other) is comprised of conserved hypothetical proteins. Since diverging from their most recent common ancestor, both M. leprae and M. lepromatosis have continued to lose additional DNA from their genomes. Losses have occurred from different regions and both organisms have accumulated “species-specific” genes, pseudogenes, and genomic regions . The nucleotide identity between corresponding CDS of both species is ~93%, while the pseudogenes have accumulated more divergence (~82% identity), perhaps due to lower selection pressure. The process of reductive evolution is evident in several obligate intracellular bacterial pathogens (e.g., Rickettsia, Chlamydia). Reductive evolution has been hypothesized to occur as an acclimatizing survival response to drastic change(s) in ecological niches. Hence, several genes and pathways required for survival in a previous habitat—for example, a free-living ancestor—would no longer be necessary or useful inside a specialized host. Genes whose functions are no longer required may become inactivated over time while newer genes might evolve through duplication, recombination, horizontal gene transfer, or acquisition of plasmid(s), which can facilitate additional functions. This evolution can impart a selective advantage to the recipient microbial cell in coping with new and often hostile conditions inside a host, thereby enabling their successful multiplication and dissemination. An example of this process can be seen in genome features of M. ulcerans that evolved from its aquatic free-living ancestor M. marinum. As shown in Table 1, the number of coding sequences in M. ulcerans decreased by 20% from the 5,426 CDS in its ancestor M. marinum. This decrease was accompanied by an accumulation of over 700 pseudogenes in M. ulcerans from 57 in M. marinum . The M. leprae and M. lepromatosis genomes are extreme examples of reductive evolution seen in the form of genome downsizing and the accumulation of massive numbers of pseudogenes. The resultant metabolic streamlining, particularly the loss of several catabolic functions and redundant pathways, as compared to M. tuberculosis, has shaped M. leprae into a highly specialized, niche-adapted obligate intracellular pathogen , . Based on the nucleotide substitution rate in M. leprae pseudogenes, it has been estimated that a massive pseudogenization event took place in the last 20 million years , . Based upon genome-wide phylogenetic comparison and Bayesian dating analysis of M. leprae and M. lepromatosis, it appears that the species diverged ~14 million years ago . The pseudogene formation appears to have occurred as a single event, perhaps as a result of a sudden change of lifestyle from a free living to a highly specialized niche inside a host. However, it is evident that this process has continued, albeit at a much slower rate, thereby accounting for the accumulation of ‘specific’ pseudogenes and genomic deletions (present in M. lepromatosis but not in M. leprae and vice versa). This continuing process accounts for nearly 5% of the genome of both organisms being species-specific, most of which, however, is composed of pseudogenes with very few exceptions. For example, the genomic region containing the intact hemN gene in M. lepromatosis is completely absent in the M. leprae genome (see the next section for further discussion). Another example of the continuation of pseudogene formation in more recent evolutionary history can be seen from the genome sequencing of M. leprae clinical isolates, where ten new pseudogenes have been identified in different strains. These new pseudogenes are not present in the M. leprae TN genome but were detected when an additional 16 M. leprae genomes, belonging to diverse phylogeographic origins, were sequenced , . It is noteworthy that the age of the most recent common ancestor of these 16 M. leprae strains was determined to be within the last 5000 years . Therefore, the new pseudogenes must have appeared within this time span. The reduction in M. leprae genome size and loss of synteny in comparison to M. tuberculosis is considered a result of extensive recombinational events between various copies of repetitive elements. These elements belong to four families known as RLEP (present in 37 copies), REPLEP (15 copies), LEPREP (8 copies), and LEPRPT (5 copies) . The corresponding sequences in the M. lepromatosis genome were also found, albeit with a divergence rate ranging from 75–90% at the nucleotide level. It appears that the genome-downsizing was mediated in the most recent common ancestor by these repeats. The repeats, present in higher copy number in the M. leprae genome, have accumulated greater divergence in comparison to the corresponding M. lepromatosis repeats. However, the exact copy number of these repeats in M. lepromatosis is unknown, as the current assembly has several gaps and repeats tend to be at the ends of contigs. The determination of multicopy templates can be useful for a more sensitive detection/enumeration of M. lepromatosis DNA, similar to the RLEP-based assay for M. leprae . Mycobacterial pathogens possess highly polymorphic proline-glutamate (PE) rich proteins and proline-proline-glutamate (PPE) proteins that are unusually high in G+C content and possibly impart genetic and antigenic variations. The M. tuberculosis genome possesses 167 PE/PPE genes . In contrast, both M. leprae and M. lepromatosis possess fewer than 9 PE/PPE genes, which in part accounts for their lower overall G+C content. It is noteworthy that the average G+C content of genes in M. leprae and M. lepromatosis is ~60%, while the pseudogenes and non-coding regions have a G+C content of ~56.5 and 54.5%, respectively. Hence, another reason for the unusually low G+C content of M. leprae is the accumulation of massive numbers of translationally inert pseudogenes, which perhaps do not have codon usage preference, unlike the active genes . The ability to acquire iron within vertebrate hosts is a critical requirement for nearly all bacterial pathogens. Iron uptake by bacteria inside host tissues is a particularly important requirement for obligate intracellular pathogens, for which they have developed different pathways. For the purpose of understanding the potential capacities and limitations of M. leprae to acquire iron from its environment, it is informative to compare M. haemophilum to M. leprae and M. lepromatosis. Among culturable mycobacteria, M. haemophilum has unique requirements for iron supplementation to facilitate its growth. Among sequenced mycobacterial species, it is also the most similar to M. leprae and M. lepromatosis, both by phylogenetic comparison of several genes ,  as well as by comparison of whole genomes . Both M. leprae and M. lepromatosis lack mbt-1 and mbt-2 gene clusters (necessary for the synthesis of mycobactin and carboxymycobactin siderophores) and iron-regulated transporters A (irtA) and irtB (functioning in the uptake of siderophore-bound iron). The ESX-3 secretion system has also been implicated in the acquisition of iron from mycobacterial siderophores , , . M. leprae and M. lepromatosis lack a readily identifiable rv0286 (ppe4) homologue within the esx-3 locus , , a deficit which may impact the ability of the ESX-3 secretion system to function in iron acquisition . The absence of these various loci relevant for siderophore-mediated iron uptake is shared by M. haemophilum, an emerging opportunistic pathogen which requires external iron supplementation for its growth on artificial media . Therefore, it is of interest to investigate the genomic repertoire in M. haemophilum that enables iron uptake and utilization from iron (hemin)-supplemented media. This question has been recently investigated in detail by sequencing the M. haemophilum genome, which revealed that M. haemophilum possesses a homolog (B586_01335) of the M. tuberculosis gene rv0203 . In M. tuberculosis, gene rv0203 encodes a secreted heme-binding protein believed to act in combination with the MmpL11 and MmpL3 inner membrane proteins and constitutes a putative heme acquisition system . While both M. leprae and M. lepromatosis possess intact mmpL11 and mmpL3 with high (~90%) nucleotide identity to those in M. haemophilum, they lack the counterpart of Rv0203 (Figure 1). This lack may result in defects in the capacity to scavenge heme-iron or utilize externally supplemented hemin in media. FIG 1 Comparison of a Putative Heme-Acquisition System in M. leprae (top) and M. tuberculosis. In M. tuberculosis, rv0203, along with the mycobacterial membrane proteins mmpL11 and mmpL3, constitute a functional iron acquisition system, which is also present in M. haemophilum (not shown). 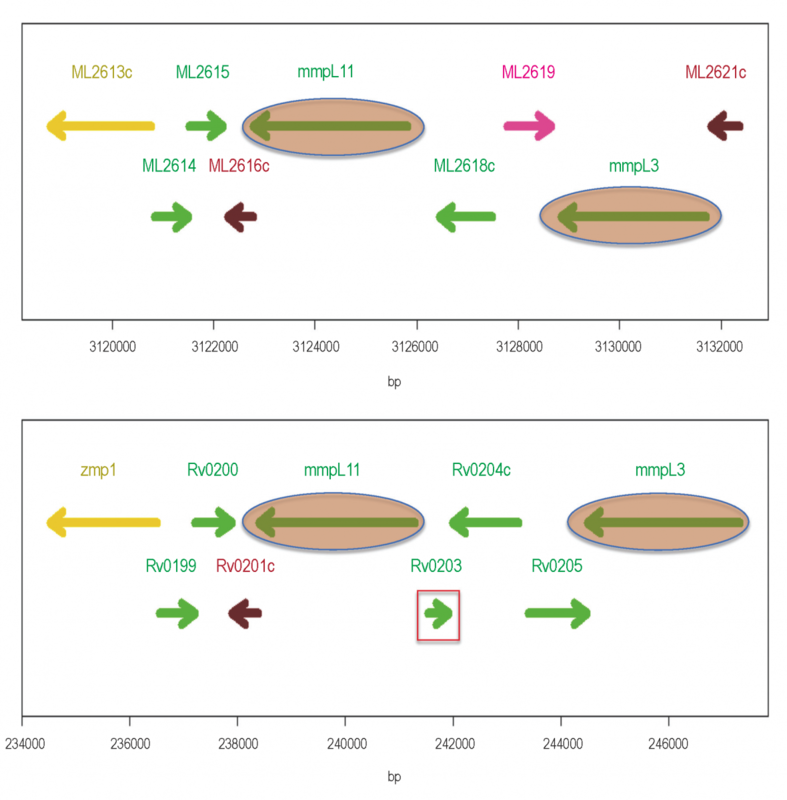 In contrast to M. tuberculosis and M. haemophilum, the genome of M. leprae has retained mmpL11 and mmpL3 (highlighted by ovals) while the corresponding gene for rv0203 (marked by a red square) is missing, presumably making this system non-functional. The genome coordinates are shown. More recently, a screen for M. tuberculosis transposon mutants resistant to the toxic heme analogue gallium (III)-porphyrin (Ga-PIX) has uncovered proteins required for heme utilization by the bacterium, including the cell surface accessible PPE36 and PPE62 (predicted outer membrane protein) and the periplasmic Rv0265c . In this model, heme uptake across the inner membrane is mediated by a transporter that remains to be identified. The M. haemophilum genome encodes a protein (B586_00960) with substantial homology to Rv0265c (79% identity), while the M. leprae counterpart (ML2548) is annotated as a pseudogene . Homology among PPE proteins can make it challenging to determine the presence or absence of a specific family member. However, M. haemophilum encodes a protein (B586_10660) with 79% identity to PPE36 and in a similar chromosomal context, while a correspondingly close homologue is absent from M. leprae . This absence may be significant regarding the capacity for heme iron acquisition, as a PPE36 deletion mutant of M. tuberculosis failed to grow in a minimal medium with hemin as the sole iron source . Both M. leprae and M. lepromatosis possess a homologue of mhuD (mycobacterial heme utilization, degrader) which encodes a heme-degrading enzyme important for the cytoplasmic release of iron from heme , . The homologue shares over 90% amino acid identity with its counterpart in M. haemophilum. In summary, M. leprae and M. lepromatosis appear to lack components of putative mycobacterial heme iron acquisition pathways, which are present in M. haemophilum. Of further note, M. leprae has lost the genomic region containing hemN, a putative component of the heme biosynthetic pathway that is present in both M. lepromatosis and M. haemophilum. The loss of hemN from the M. leprae genome took place after M. leprae and M. lepromatosis diverged from their ancestor. The unique lack of hemN implies that M. leprae may be even more limited in heme production than M. lepromatosis. However, it should also be noted that, despite its annotation, it remains questionable whether hemN actually plays a role in mycobacterial heme biosynthesis , . Surprisingly, despite their small genome sizes and the effects of reductive evolution, M. lepromatosis and M. leprae both possess two copies of the Nramp family gene (natural resistance-associated macrophage protein, mntH/nramp), similar to M. haemophilum (B586_01840 and _06145), which perhaps points to a similar role in their in vivo niche. In contrast, M. tuberculosis possesses only a single copy . Nramp homologues are pH-dependent divalent cation transporters that are candidate iron uptake factors . In addition to the above comparison of the iron-uptake capabilities of M. leprae and M. lepromatosis with M. haemophilum, it is noteworthy that the latter’s genome is much bigger and possesses several other genes/pathways, a few of which might contribute additional metabolic capabilities that can enable its in vitro cultivation in iron-supplemented media. For instance, the presence of ferrous iron transport proteins encoded by feoA and feoB enable the transport of ferrous ion across cytoplasmic membrane , . feoA and feoB are present in several other non-tuberculous mycobacteria (M. kansasii, M. marinum, M. genavense, and M. xenopi) but missing in M. tuberculosis, M. leprae, and M. lepromatosis. Additionally, the M. haemophilum genome possesses another locus (B586_00145 to _00155) with homology to the ATP binding cassette (ABC) transport system of iron/siderophore/heme/vitamin B12. This system is important for iron uptake in other bacteria  but is missing from the genomes of M. tuberculosis, M. leprae, and M. lepromatosis. Leprosy is essentially a disease of nerves and, hence, neuropathogenicity is the defining hallmark of the etiological agent. In this regard, the neurotropism (see Chapter 9.1; Chapter 9.2) of M. leprae has been attributed to the presence of laminin-binding protein (encoded by ML1683c) and the terminal trisaccharide moiety of phenolic glycolipid (PGL-1) , . Both are bacterial cell wall components. The genes for these adhesion systems are intact in the M. lepromatosis genome and are highly conserved . Hence M. lepromatosis’s tropism for nerves has a genomic basis, although experimental evidence from clinical and histopathological specimens will provide a more definitive answer. Leprosy has been described as a great imitator  due to its diverse and confusing clinical presentations (see Chapter 2.1). This diversity makes leprosy diagnosis a challenge, especially for physicians with limited experience in diagnosing and managing the disease. The biggest difficulty in the areas where leprosy is extremely rare is the lack of clinical suspicion due to unfamiliarity among physicians. Declining leprosy expertise among physicians can cause diagnostic delays, thus contributing to serious neurological consequences , , . Using sensitive and specific diagnostic tests in cases in which clinical symptoms are suggestive of leprosy can help minimize this problem. The identification of the M. leprae-specific repetitive genomic sequence RLEP ,  has made M. leprae detection more sensitive and specific, as it is present in 37 copies in the genome. Therefore, RLEP-based PCR has been a valuable tool in leprosy diagnosis and research, especially for paucibacillary (PB) and environmental  or formalin fixed paraffin-embedded (FFPE)  specimens as well as ancient skeletal samples (see Chapter 11.1), in which DNA is often highly fragmented and quantities are minimal , , , , , , . Likewise, a similar multicopy target for M. lepromatosis would be valuable, particularly for such difficult samples. However, until multicopy loci are identified, specific genomic regions, for example hemN, are good targets for the sensitive and accurate detection of M. lepromatosis, especially in cases of co-infection with M. leprae. Notably, the mere presence of M. leprae or M. lepromatosis DNA in a patient sample does not constitute a diagnosis of leprosy (see Chapter 7.2), as a significant percentage of healthy household contacts show M. leprae DNA positivity in their nasal secretions , , . Hence, the results of PCR tests are to be interpreted in conjunction with other clinical or histopathological evidence (see Chapter 2.4). The development of newer anti-tuberculosis drugs raises the question of whether they can also be effective against M. leprae (and M. lepromatosis). In the absence of culture-based phenotypic tests, genomics offers helpful clues. For instance, the genomic target of the experimental drugs bedaquiline, benzothiazinones, and Q203 are intact in M. leprae and M. lepromatosis. In contrast, the genomic targets for the action of nitroimidazole prodrugs, PA824, TBA354, and delamanid, are missing. The Mouse Foot Pad (MFP) assay has been the gold standard phenotypic test for the determination of anti-leprosy drug resistance (see Chapter 5.2; Chapter 5.3). However, the routine use of the MFP assay is impractical , . Thanks to the assay’s excellent correlation with the resistance-associated mutations in the drug resistance-determining regions (DRDRs) of folp1 (dapsone), rpoB (rifampin), and gyrA (fluoroquinolones) , , , , , , , , , , , , drug resistance trends are now being monitored successfully using molecular tests that target resistance-associated mutations . The comparison of corresponding genomic regions in M. lepromatosis reveals drug susceptibility-related sequences, which is reassuring as it indicates that the same drugs will likely be effective for both leprosy pathogens. Successful treatment of M. lepromatosis-infected patients with standard MDT has been reported . Even before the advancements of detailed sequence comparisons, it was noted that M. leprae strains from diverse geographical origins possess minimal genomic diversity ,  and, hence, discrimination of one strain from another was challenging. Comparative genomics of a limited number of M. leprae isolates has helped in identifying phylogeographically informative SNPs  for strain typing. Upon survey of these SNPs in isolates from diverse geographical origins, a SNP-typing scheme was developed that places M. leprae strains from all over the world into four major SNP-types, identified as SNP Types 1 through 4. These four SNP-types were further resolved into 16 subtypes (1A through 4P) upon whole genome sequencing and comparison with another M. leprae strain (Br4923 from Brazil) . The SNP genotypes generally exhibit geographical association, as represented in Table 2. The SNP-genotyping scheme has been very helpful in studying the global dissemination of leprosy, along with ancient human migrations, and has also helped in studying the evolutionary history of M. leprae and M. lepromatosis , . In addition, the scheme has been successfully used for molecular epidemiological investigations into the focal transmission of M. leprae ,  and the identification of M. leprae genotypes in environmental samples from the surroundings of leprosy patients . Though SNPs provide a reliable phylogenetic association between M. leprae strains from geographically distant locations, they provide limited resolution for studying short-range transmission due to their relative stability , . This table is based upon the literature and other recent findings, which together represent >1000 strains from all over the world. However, it should be noted that further diversity of M. leprae strains in an area may be revealed when a representative number of strains are analyzed by SNP-genotyping to detect the genotypes present in a lower frequency. * In USA, nearly 2/3 of the cases are found in patients with immigration histories from leprosy-endemic countries and often represent the genotypes prevalent in their countries of origin. ** All M. leprae strains found in wild armadillos and most USA patients with no history of foreign residence were found to be type 3I and shared striking levels of identity upon their detailed genomic analysis using SNPs, VNTR, and whole genome sequencing. VNTRs are stretches of 2–50 nucleotide long repeats present in variable copy numbers.These VNTRs are highly variable and evolve much more rapidly than SNPs due to slipped-strand mispairing, which makes the probability of mutations (insertion and deletion of repeat copies) up to 100,000 times more frequent as compared to SNPs , . Though rapid evolution makes them ideal for increased resolution, the phylogenetic information is lost in the descendent population. Several VNTR loci have been identified in the M. leprae genome ,  and have been used for VNTR-typing aimed at the discrimination of M. leprae isolates in leprosy endemic regions , , , , , , . However, some VNTR loci have been reported to be hyper-variable, as they vary among samples from different lesions of a single patient, thereby making the VNTR inappropriate for molecular epidemiological investigation . When SNP and VNTR-typing are combined, the limitations of both are overcome. Therefore, a combined application of SNPs with selected VNTRs (showing a reliable level of allelic diversity) was developed, providing much higher resolution. At the same time, the predominance of SNP markers (for example, 84 informative SNPs in comparison to a battery of 10 VNTRs) helps in retaining the phylogeographic association while still achieving an optimal level of strain differentiation. Phylogeographic association and strain differentiation are two important components of a genotyping method. It was the power of this combined use of SNPs (identified by whole genome sequencing of M. leprae strains from the same geographic area) and VNTRs that confirmed the role of armadillos in perpetuating zoonotic leprosy in the southern United States , , which had long been suspected , , , , , ,  but was never confirmed earlier. Whole genome sequencing (WGS) directly from archived patient biopsies and skeletal samples has demonstrated its value and feasibility as an “all-in-one” approach to investigate pathogenesis, molecular drug susceptibility testing, molecular epidemiology, and phylogeny-related questions. In addition, the preparation of sequencing-ready libraries converts M. leprae genomic DNA into a valuable “renewable” resource for further investigations into the pathogen as well as into the host. While it is tempting to advocate for the routine application of WGS in the clinical setting, it first must be made cost- and effort-effective. With the current pace of improvements in library preparation and enrichment methods, WGS could become a realistic proposition in the foreseeable future. WGS also allows for investigations into M. leprae strains from the PB portion of the clinical spectrum of leprosy. In the latest application of this approach, the phylogenomics of 154 M. leprae strains from 25 countries were investigated, revealing novel insights into the evolution of drug resistance in M. leprae . Another potential application of WGS is in the discrimination of relapse versus reinfection. It is important to differentiate whether the second episode of the disease is attributable to endogenous reactivation of persisting M. leprae bacilli from the first episode or the result of an exogenous reinfection with another strain. This determination requires genome-scale comparison of M. leprae from the first and any subsequent episodes of the disease. The comparison can be done using archived clinical samples from the various episodes. This approach, which was successfully used in a recent study, proved that some of the relapses could be attributed to exogenous reinfection while others could be due to endogenous reactivation . The availability of this information could be helpful in determining the optimal duration of therapy for PB and MB cases. Based upon the genome-wide comparison of M. leprae from around the world, including DNA from 10–13thcentury leprosy skeletons from Europe (see Chapter 11.1), the M. leprae genotype 3K strains were found to be the closest to M. lepromatosis, The type 3K samples have been reported from China, Iran, Indonesia, Japan, Korea, New Caledonia, Philippines, Turkey , , , and U.S. patients originating from Guam and Micronesia , . The wide geographic distribution of this genotype and the insufficient sampling for whole genome comparison studies precludes an accurate estimate of the tentative origin of leprosy bacilli. However, the 16 M. leprae genomes exhibit only ~800 SNPs, while the comparison with M. lepromatosis reveals over 275,000 SNPs, indicating that M. lepromatosis has deep evolutionary divergence from M. leprae  ranging in the time frame of several million years. By comparison, it is noteworthy that the species belonging to the M. tuberculosis complex have evolved from their most recent common ancestor in only the last 7000 years . Genomics has opened up several avenues for the study of M. leprae pathogenesis, metabolism, and transmission as well as for understanding the origin, evolution, and global dissemination of the disease. Useful genomic insights into the biology of M. leprae and M. lepromatosis have enabled the development of sensitive assays for the accurate detection of these pathogens and have also helped in their clinical management, for example, by monitoring anti-leprosy drug resistance trends. In addition, the comparative genomics of various mycobacterial pathogens (M. leprae, M. lepromatosis, M. haemophilum, M. ulcerans, M. marinum, etc.) has been helpful for an improved understanding of the process of mycobacterial evolution and niche adaptation. Dr. Pushpendra Singh is grateful to the following funding agencies/organizations for supporting his research: the University Grants Commission Faculty Recharge Programme; The Ramalingaswami Re-entry Fellowship (Department of Biotechnology, Government of India); The Maharaja Sayajirao University of Baroda, Vadodara, India; the Turing Foundation and the Leprosy Research Initiative, The Netherlands; the effect:hope (Leprosy Mission Canada), and the Seeding Labs Boston, USA. Dr. JoAnn Tufariello and Dr. William R Jacobs, Jr., would also like to acknowledge the generous support of effect:hope (Leprosy Mission Canada) on behalf of the Research to Stop Neglected Tropical Disease Transmission (R2STOP) Initiative. Dr. Jacobs would also like to acknowledge the support provided by NIH grant AI026170. Ms Priya Paithankar and Ms Purna Dwivedi’s help in compiling and formatting the reference list is also appreciated. ^ World Health Organization (WHO). 2013. Global leprosy: update on the 2012 situation. Wkly Epidemiol Rec 88(35):365–380. ^ Shepard CC. 1960. The experimental disease that follows the injection of human leprosy bacilli into foot-pads of mice. J Exp Med 112(3):445–454. ^ Kirchheimer WF, Storks EE. 1971. Attempts to establish the armadillo (Dasypus novemcinctus Linn.) as a model for the study of leprosy. I. Report of lepromatoid leprosy in an experimentally infected armadillo. Int J Lepr Other Mycobact Dis 39(3):693–702. ^ Adams LB, Pena MT, Sharma R, Hagge DA, Schurr E, Truman RW. 2012. Insights from animal models on the immunogenetics of leprosy: a review. Mem Inst Oswaldo Cruz 107(Suppl 1):197–208. ^ Balamayooran G, Pena M, Sharma R, Truman RW. 2015. The armadillo as an animal model and reservoir host for Mycobacterium leprae. Clin Dermatol 33(1):108–115. ^ Sharma R, Lahiri R, Scollard DM, Pena M, Williams DL, Adams LB, Figarola J, Truman RW. 2013. The armadillo: a model for the neuropathy of leprosy and potentially other neurodegenerative diseases. Dis Model Mech 6(1):19–24. ^ Truman R. 2005. Leprosy in wild armadillos. Lepr Rev 76(3):198–208. ^ Truman RW, Ebenezer GJ, Pena MT, Sharma R, Balamayooran G, Gillingwater TH, Scollard DM, McArthur JC, Rambukkana A. 2014. The armadillo as a model for peripheral neuropathy in leprosy. ILAR J 54(3):304–314. ^ Clark-Curtiss JE, Jacobs WR, Docherty MA, Ritchie LR, Curtiss R III. 1985. Molecular analysis of DNA and construction of genomic libraries of Mycobacterium leprae. J Bacteriol 161(3):1093–1102. ^ Eiglmeier K, Honoré N, Woods SA, Caudron B, Cole ST. 1993. Use of an ordered cosmid library to deduce the genomic organization of Mycobacterium leprae. Mol Microbiol 7(2):197–206. a, b, c, d, e, f, g Cole ST, Eiglmeier K, Parkhill J, James KD, Thomson NR, Wheeler PR, Honoré N, Garnier T, Churcher C, Harris D, Mungall K, Basham D, Brown D, Chillingworth T, Connor R, Davies RM, Devlin K, Duthoy S, Feltwell T, Fraser A, Hamlin N, Holroyd S, Hornsby T, Jagels K, Lacroix C, Maclean J, Moule S, Murphy L, Oliver K, Quail MA, Rajandream MA, Rutherford KM, Rutter S, Seeger K, Simon S, Simmonds M, Skelton J, Squares R, Squares S, Stevens K, Taylor K, Whitehead S, Woodward JR, Barrell BG. 2001. Massive gene decay in the leprosy bacillus. Nature 409(6823):1007–1011. ^ Grosset JH, Cole ST. 2001. Genomics and the chemotherapy of leprosy. Lepr Rev 72(4):429–440. a, b, c, d, e Schuenemann VJ, Singh P, Mendum TA, Krause-Kyora B, Jäger G, Bos KI, Herbig A, Economou C, Benjak A, Busso P, Nebel A, Boldsen JL, Kjellström A, Wu H, Stewart GR, Taylor GM, Bauer P, Lee OY, Wu HH, Minnikin DE, Besra GS, Tucker K, Roffey S, Sow SO, Cole ST, Nieselt K, Krause J. 2013. Genome-wide comparison of medieval and modern Mycobacterium leprae. Science 341(6142):179–183. a, b, c, d, e, f Monot M, Honoré N, Garnier T, Zidane N, Sherafi D, Paniz-Mondolfi A, Matsuoka M, Taylor GM, Donoghue HD, Bouwman A, Mays S, Watson C, Lockwood C, Khamesipour A, Dowlati Y, Jianping S, Rea TH, Vera-Cabrera L, Stefani MM, Banu S, Macdonald M, Sapkota BR, Spencer JS, Thomas J, Harshman K, Singh P, Busso P, Gattiker A, Rougemont J, Brennan PJ, Cole ST. 2009. Comparative genomic and phylogeographic analysis of Mycobacterium leprae. Nat Genet 41(12):1282–1289. ^ Macia̧g A, Dainese E, Rodriguez GM, Milano A, Provvedi R, Pasca MR, Smith I, Palù G, Riccardi G, Manganelli R. 2007. Global analysis of the Mycobacterium tuberculosis Zur (FurB) regulon. J Bacteriol 189(3):730–740. ^ Milanoa A, Branzonia M, Canneva F, Profumo A, Riccardi G. 2004. The Mycobacterium tuberculosis Rv2358-furB operon is induced by zinc. Res Microbiol 155(3):192–200. ^ Lucio R, Alvarado I. 1852. Opúsculo sobre el mal de San Lázaro, ó, Elefantiasis de los griegos p 53. M Murguía y Cia, Mexico. ^ Latapí, F, Zamora A. 1948. The “Spotted” Leprosy of Lueio (La lepra “Manchada” de Lucio). An introduction to its clinical and histological study. Int J Lepr 16(4):421–430. a, b, c, d, e Han XY, Seo YH, Sizer KC, Schoberle T, May GS, Spencer JS, Li W, Nair RG. 2008. A new Mycobacterium species causing diffuse lepromatous leprosy. Am J Clin Pathol 130(6):856–864. ^ Jessamine PG, Desjardins M, Gillis T, Scollard D, Jamieson F, Broukhanski G, Chedore P, McCarthy A. 2012. Leprosy-like illness in a patient with Mycobacterium lepromatosis from Ontario, Canada. J Drugs Dermatol 11:229–233. a, b Han XY, Aung FM, Choon SE, Werner B. 2014. Analysis of the leprosy agents Mycobacterium leprae and Mycobacterium lepromatosis in four countries. Am J Clin Pathol 142(4):524–532. ^ Monteiro R, de Abreu MA, Tiezzi MG, Roncada EV, de Oliveira CC, Ortigosa LC. 2012. Lucio’s phenomenon: another case reported in Brazil. An Bras Dermatol 87(2):296–300. ^ Souza CS, Roselino AM, Figueiredo F, Foss NT. 2000. Lucio’s phenomenon: clinical and therapeutic aspects. Int J Lepr Other Mycobact Dis 68(4):417–425. ^ Kumari R, Thappa DM, Basu D. 2008. A fatal case of Lucio phenomenon from India. Dermatol Online J 14(2):10. ^ Saoji V, Salodkar A. 2001. Lucio leprosy with lucio phenomenon. Indian J Lepr 73(3):267–272. ^ Thappa DM, Karthikeyan K, Kumar BJ. 2002. Is it Lucio leprosy with Lucio phenomenon or something else? Indian J Lepr 74(2):161–166. ^ Golchai J, Zargari O, Maboodi AT, Maboodi A, Granmayeh S. 2004. Lepromatous leprosy with extensive unusual ulcerations and cachexia. Is it the first case of Lucio’s phenomenon from Iran? Int J Lepr Other Mycobact Dis 72(1):56–59. ^ Choon SE, Tey KE. 2009. Lucio’s phenomenon: a report of three cases seen in Johor, Malaysia. Int J Dermatol 48(9):984–988. a, b, c Han XY, Sizer KC, Thompson EJ, Kabanja J, Li J, Hu P, Gómez-Valero L, Silva FJ. 2009. Comparative sequence analysis of Mycobacterium leprae and the new leprosy-causing Mycobacterium lepromatosis. J Bacteriol 191(19):6067–6074. ^ Vera-Cabrera L, Escalante-Fuentes WG, Gomez-Flores M, Ocampo-Candiani J, Busso P, Singh P, Cole ST. 2011. Case of diffuse lepromatous leprosy associated with “Mycobacterium lepromatosis.” J Clin Microbiol 49(12):4366–4368. ^ Gillis TP, Scollard DM, Lockwood DNJ. 2011. What is the evidence that the putative Mycobacterium lepromatosis species causes diffuse lepromatous leprosy? Lepr Rev 82(3):205–209. ^ Han XY, Sizer KC, Velarde-Félix JS, Frias-Castro LO, Vargas-Ocampo F. 2012. The leprosy agents Mycobacterium lepromatosis and Mycobacterium leprae in Mexico. Int J Dermatol 51(8):952–959. ^ Meredith A, Del Pozo J, Smith S, Milne E, Stevenson K, McLuckie J. 2014. WILDLIFE: Leprosy in red squirrels in Scotland. Vet Rec 175(11):285–286. a, b Avanzi C, Del-Pozo J, Benjak A, Stevenson K, Simpson VR, Busso P, McLuckie J, Loiseau C, Lawton C, Schoening J, Shaw DJ, Piton J, Vera-Cabrera L, Velarde-Felix JS, McDermott F, Gordon SV, Cole ST, Meredith AL. 2016. Red squirrels in the British Isles are infected with leprosy bacilli. Science 354(6313):744–747. a, b, c, d, e Cole ST, Brosch R, Parkhill J, Garnier T, Churcher C, Harris D, Gordon SV, Eiglmeier K, Gas S, Barry CE III, Tekaia F, Badcock K, Basham D, Brown D, Chillingworth T, Connor R, Davies R, Devlin K, Feltwell T, Gentles S, Hamlin N, Holroyd S, Hornsby T, Jagels K, Krogh A, McLean J, Moule S, Murphy L, Oliver K, Osborne J, Quail MA, Rajandream MA, Rogers J, Rutter S, Seeger K, Skelton J, Squares R, Squares S, Sulston JE, Taylor K, Whitehead S, Barrell BG. 1998. Deciphering the biology of Mycobacterium tuberculosis from the complete genome sequence. Nature 393(6685):537–544. a, b, c, d, e, f, g, h Singh P, Benjak A, Schuenemann VJ, Herbig A, Avanzi C, Busso P, Nieselt K, Krause J, Vera-Cabrera L, Cole ST. 2015. Insight into the evolution and origin of leprosy bacilli from the genome sequence of Mycobacterium lepromatosis. Proc Natl Acad Sci 112(14):4459–4464. a, b, c, d, e Tufariello JM, Kerantzas CA, Vilchèze C, Calder RB, Nordberg EK, Fischer JA, Hartman TE, Yang E, Driscoll T, Cole LE, Sebra R, Maqbool SB, Wattam AR, Jacobs WR Jr. 2015. The complete genome sequence of the emerging pathogen Mycobacterium haemophilum explains its unique culture requirements. MBio 6(6):e01313–e01315. ^ Stinear TP, Seemann T, Harrison PF, Jenkin GA, Davies JK, Johnson PD, Abdellah Z, Arrowsmith C, Chillingworth T, Churcher C, Clarke K, Cronin A, Davis P, Goodhead I, Holroyd N, Jagels K, Lord A, Moule S, Mungall K, Norbertczak H, Quail MA, Rabbinowitsch E, Walker D, White B, Whitehead S, Small PL, Brosch R, Ramakrishnan L, Fischbach MA, Parkhill J, Cole ST. 2008. Insights from the complete genome sequence of Mycobacterium marinum on the evolution of Mycobacterium tuberculosis. Genome Res 18(5):729–741. a, b Stinear TP, Seemann T, Pidot S, Frigui W, Reysset G, Garnier T, Meurice G, Simon D, Bouchier C, Ma L, Tichit M, Porter JL, Ryan J, Johnson PD, Davies JK, Jenkin GA, Small PL, Jones LM, Tekaia F, Laval F, Daffé M, Parkhill J, Cole ST. 2007. Reductive evolution and niche adaptation inferred from the genome of Mycobacterium ulcerans, the causative agent of Buruli ulcer. Genome Res 17(2):192–200. a, b Gómez-Valero L, Rocha EPC, Latorre A, Silva FJ. 2007. Reconstructing the ancestor of Mycobacterium leprae: the dynamics of gene loss and genome reduction. Genome Res 17(8):1178–1185. ^ Han XY, Mistry NA, Thompson EJ, Tang H, Khanna K, Zhang L. 2015. Draft genome sequence of new leprosy agent Mycobacterium lepromatosis. Genome Announc 3(3):9–10. ^ Scollard DM, Adams LB, Gillis TP, Krahenbuhl JL, Truman RW, Williams DL. 2006. The continuing challenges of leprosy. Clin Microbiol Rev 19(2):338–381. ^ Han XY, Silva FJ. 2014. On the age of leprosy. PLoS Negl Trop Dis 8(2):e2544. ^ Cole ST, Supply P, Honoré N. 2001. Repetitive sequences in Mycobacterium leprae and their impact on genome plasticity. Lepr Rev 72(4):449–461. a, b Grosskinsky CM, Jacobs WR, Clark-Curtiss JE, Bloom BR. 1989. Genetic relationships among Mycobacterium leprae, Mycobacterium tuberculosis, and candidate leprosy vaccine strains determined by DNA hybridization: identification of an M. leprae-specific repetitive sequence. Infect Immun 57(5):1535–1541. ^ Mignard S, Flandrois JP. 2008. A seven-gene, multilocus, genus-wide approach to the phylogeny of mycobacteria using supertrees. Int J Syst Evol Microbiol 58(6):1432–1441. ^ Serafini A, Boldrin F, Palù G, Manganelli R. 2009. Characterization of a Mycobacterium tuberculosis ESX-3 conditional mutant: essentiality and rescue by iron and zinc. J Bacteriol 191(20):6340–6344. ^ Serafini A, Pisu D, Palù G, Rodriguez GM, Manganelli R. 2013. The ESX-3 secretion system is necessary for iron and zinc homeostasis in Mycobacterium tuberculosis. PLoS One 8(10). ^ Siegrist MS, Unnikrishnan M, McConnell MJ, Borowsky M, Cheng TY, Siddiqi N, Fortune SM, Moody DB, Rubin EJ. 2009. Mycobacterial Esx-3 is required for mycobactin-mediated iron acquisition. Proc Natl Acad Sci 106(44):18792–18797. ^ Tufariello JM, Chapman JR, Kerantzas CA, Wong KW, Vilchèze C, Jones CM, Cole LE, Tinaztepe E, Thompson V, Fenyö D, Niederweis M, Ueberheide B, Philips JA, Jacobs WR Jr. 2016. Separable roles for Mycobacterium tuberculosis ESX-3 effectors in iron acquisition and virulence. Proc Natl Acad Sci 113(3):E348–E357. ^ Tullius MV, Harmston CA, Owens CP, Chim N, Morse RP, McMath LM, Iniguez A, Kimmey JM, Sawaya MR, Whitelegge JP, Horwitz MA, Goulding CW. 2011. Discovery and characterization of a unique mycobacterial heme acquisition system. Proc Natl Acad Sci 108(12):5051–5056. a, b Mitra A, Speer A, Lin K, Ehrt S, Niederweis M. 2017. PPE surface proteins are required for heme utilization by Mycobacterium tuberculosis. MBio 8(1):e01720–16. ^ Kapopoulou A, Lew JM, Cole ST. 2011. The MycoBrowser portal: a comprehensive and manually annotated resource for mycobacterial genomes. Tuberculosis 91(1):8–13. ^ Gey van Pittius NC, Sampson SL, Lee H, Kim Y, van Helden PD, Warren RM. 2006. Evolution and expansion of the Mycobacterium tuberculosis PE and PPE multigene families and their association with the duplication of the ESAT-6 (esx) gene cluster regions. BMC Evol Biol 6:95. ^ Chim N, Iniguez A, Nguyen TQ, Goulding CW. 2010. Unusual diheme conformation of the heme degrading protein from Mycobacterium tuberculosis. J Mol Biol 395(3):595–608. ^ Nambu S, Matsui T, Goulding CW, Takahashi S, Ikeda-Saito M. 2013. A new way to degrade heme: the Mycobacterium tuberculosis enzyme MhuD catalyzes heme degradation without generating CO. J Biol Chem 288(14):10101–10109. ^ Dailey HA, Gerdes S. 2015. HemQ: an iron-coproporphyrin oxidative decarboxylase for protoheme synthesis in Firmicutes and Actinobacteria. Arch Biochem Biophys 574:27–35. ^ Dailey HA, Gerdes S, Dailey TA, Burch JS, Phillips JD. 2015. Noncanonical coproporphyrin-dependent bacterial heme biosynthesis pathway that does not use protoporphyrin. Proc Natl Acad Sci 112(7):2210–2215. ^ Kim H, Lee H, Shin D. 2012. The FeoA protein is necessary for the FeoB transporter to import ferrous iron. Biochem Biophys Res Commun 423(4):733–738. ^ Marlovits TC, Haase W, Herrmann C, Aller SG, Unger VM. 2002. The membrane protein FeoB contains an intramolecular G protein essential for Fe(II) uptake in bacteria. Proc Natl Acad Sci 99(25):16243–16248. ^ Köster W. 2001. ABC transporter-mediated uptake of iron, siderophores, heme and vitamin B12. Res Microbiol 152(3–4):291–301. ^ Ng V, Zanazzi G, Timpl R, Talts JF, Salzer JL, Brennan PJ, Rambukkana A. 2000. Role of the cell wall phenolic glycolipid-1 in the peripheral nerve predilection of Mycobacterium leprae. Cell 103(3):511–524. ^ Rambukkana A, Salzer JL, Yurchenco PD, Tuomanen EI. 1997. Neural targeting of Mycobacterium leprae mediated by the G domain of the laminin-α2 chain. Cell 88(6):811–821. ^ Mohanan S, Devi AS, Kumari R, Thappa DM, Ganesh RN. 2014. Novel presentation of lepromatous leprosy in an erythema gyratum repens-like pattern. Int J Dermatol 53(2):210–212. ^ Chen XS, Li WZ, Jiang C, Ye GY. 2000. Leprosy in China: delay in the detection of cases. Ann Trop Med Parasitol 94(2):181–188. ^ Liu D, Li G, Huang W, Gao J, Yue C, Xiao Q. 2009. Analysis of newly detected leprosy cases and misdiagnosis in Wuhan (1990–2004). Lepr Rev 80(4):410–415. ^ Lockwood DN, Reid AJ. 2001. The diagnosis of leprosy is delayed in the United Kingdom. QJM 94(4):207–212. a, b Clark-Curtiss JE, Walsh GP. 1989. Conservation of genomic sequences among isolates of Mycobacterium leprae. J Bacteriol 171(9):4844–4851. ^ Lavania M, Katoch K, Sachan P, Dubey A, Kapoor S, Kashyap M, Chauhan DS, Singh HB, Sharma VD, Jadhav RS, Katoch VM. 2006. Detection of Mycobacterium leprae DNA from soil samples by PCR targeting RLEP sequences. J Commun Dis 38(3):269–273. a, b Yan W, Xing Y, Yuan LC, De Yang R, Tan FY, Zhang Y, Li HY. 2014. Application of RLEP real-time PCR for detection of M. leprae DNA in paraffin-embedded skin biopsy specimens for diagnosis of paucibacillary leprosy. Am J Trop Med Hyg 90(3):524–529. ^ Donoghue HD, Holton J, Spigelman M. 2001. PCR primers that can detect low levels of Mycobacterium leprae DNA. J Med Microbiol 50(2):177–182. ^ Economou C, Kjellström A, Lidén K, Panagopoulos I. 2013. Ancient-DNA reveals an Asian type of Mycobacterium lepraein medieval Scandinavia. J Archaeol Sci 40(1):465–470. ^ Haas CJ, Zink A, Pálfi G, Szeimies U, Nerlich AG. 2000. Detection of leprosy in ancient human skeletal remains by molecular identification of Mycobacterium leprae. Am J Clin Pathol 114(3):428–436. ^ Montiel R, García C, Cañadas MP, Isidro A, Guijo JM, Malgosa A. 2003. DNA sequences of Mycobacterium leprae recovered from ancient bones. FEMS Microbiol Lett 226(2):413–414. ^ Taylor GM, Blau S, Mays S, Monot M, Lee OY-C, Minnikin DE, Besra GS, Cole ST, Rutland P. 2009. Mycobacterium lepraegenotype amplified from an archaeological case of lepromatous leprosy in Central Asia. J Archaeol Sci 36(10):2408–2414. ^ Taylor GM, Tucker K, Butler R, Pike AW, Lewis J, Roffey S, Marter P, Lee OY, Wu HH, Minnikin DE, Besra GS, Singh P, Cole ST, Stewart GR. 2013. Detection and strain typing of ancient Mycobacterium leprae from a medieval leprosy hospital. PLoS One 8(4):e62406. ^ Cardona-Castro N, Beltrán-Alzate JC, Manrique-Hernández R. 2008. Survey to identify Mycobacterium leprae-infected household contacts of patients from prevalent regions of leprosy in Colombia. Mem Inst Oswaldo Cruz 103(4):332–336. ^ Job CK, Jayakumar J, Kearney M, Gillis TP. 2008. Transmission of leprosy: a study of skin and nasal secretions of household contacts of leprosy patients using PCR. Am J Trop Med Hyg 78(3):518–521. ^ Pattyn SR, Ursi D, Ieven M, Grillone S, Raes V. 1993. Detection of Mycobacterium leprae by the polymerase chain reaction in nasal swabs of leprosy patients and their contacts. Int J Lepr Other Mycobact Dis 61(3):389–393. ^ Katoch VM. 2009. The contemporary relevance of the mouse foot pad model for cultivating M. leprae. Lepr Rev 80(2):120–123. ^ Levy L, Ji B. 2006. The mouse foot-pad technique for cultivation of Mycobacterium leprae. Lepr Rev 77(1):5–24. ^ Honoré N, Perrani E, Telenti A, Grosset J, Cole ST. 1993. A simple and rapid technique for the detection of rifampin resistance in Mycobacterium leprae. Int J Lepr Other Mycobact Dis 61(4):600–604. ^ Honoré N, Roche PW, Grosset JH, Cole ST. 2001. A method for rapid detection of rifampicin-resistant isolates of Mycobacterium leprae. Lepr Rev 72(4):441–448. ^ Matsuoka M, Aye KS, Kyaw K, Tan EV, Balagon MV, Saunderson P, Gelber R, Makino M, Nakajima C, Suzuki Y. 2008. A novel method for simple detection of mutations conferring drug resistance in Mycobacterium leprae, based on a DNA microarray, and its applicability in developing countries. J Med Microbiol 57(Pt 10):1213–1219. ^ Matsuoka M, Budiawan T, Aye KS, Kyaw K, Tan EV, Cruz ED, Gelber R, Saunderson P, Balagon V, Pannikar V. 2007. The frequency of drug resistance mutations in Mycobacterium leprae isolates in untreated and relapsed leprosy patients from Myanmar, Indonesia and the Philippines. Lepr Rev 78(4):343–352. ^ Roche PW, Shrestha N, Thomas A, Honore N, Cole ST. 2000. Rapid detection of resistance to rifampicin in Mycobacterium leprae. Lepr Rev 71(Suppl):S96–S97. ^ Sapkota BR, Ranjit C, Neupane KD, Macdonald M. 2008. Development and evaluation of a novel multiple-primer PCR amplification refractory mutation system for the rapid detection of mutations conferring rifampicin resistance in codon 425 of the rpoB gene of Mycobacterium leprae. J Med Microbiol 57(Pt 2):179–184. ^ Sekar B, Arunagiri K, Kumar BN, Narayanan S, Menaka K, Oommen PK. 2011. Detection of mutations in folp1, rpoB and gyrA genes of M. leprae by PCR-direct sequencing—a rapid tool for screening drug resistance in leprosy. Lepr Rev 82(1):36–45. ^ Shetty VP, Uplekar MW, Antia NH. 1996. Primary resistance to single and multiple drugs in leprosy—a mouse footpad study. Lepr Rev 67(4):280–286. ^ Singh P, Busso P, Paniz-Mondolfi A, Aranzazu N, Monot M, Honore N, de Faria Fernandes Belone A, Virmond M, Villarreal-Olaya ME, Rivas C, Cole ST. 2011. Molecular drug susceptibility testing and genotyping of Mycobacterium leprae strains from South America. Antimicrob Agents Chemother 55(6):2971–2973. ^ Williams DL, Gillis TP. 2004. Molecular detection of drug resistance in Mycobacterium leprae. Lepr Rev 75(2):118–130. ^ Williams DL, Spring L, Harris E, Roche P, Gillis TP. 2000. Dihydropteroate synthase of Mycobacterium leprae and dapsone resistance. Antimicrob Agents Chemother 44(6):1530–1537. ^ Williams DL, Waguespack C, Eisenach K, Crawford JT, Portaels F, Salfinger M, Nolan CM, Abe C, Sticht-Groh V, Gillis TP. 1994. Characterization of rifampin-resistance in pathogenic mycobacteria. Antimicrob Agents Chemother 38(10):2380–2386. ^ World Health Organization (WHO). 2009. Guidelines for global surveillance of drug resistance in leprosy (SEA-GLP-2009.2). World Health Organization, Regional Office for South-East Asia, New Delhi, India. ^ Han XY, Jessurun J. 2013. Severe leprosy reactions due to Mycobacterium lepromatosis. Am J Med Sci 345(1):65–69. ^ Williams DL, Gillis TP, Portaels F. 1990. Geographically distinct isolates of Mycobacterium leprae exhibit no genotypic diversity by restriction fragment‐length polymorphism analysis. Mol Microbiol 4(10):1653–1659. a, b Monot M, Honoré N, Garnier T, Araoz R, Coppée JY, Lacroix C, Sow S, Spencer JS, Truman RW, Williams DL, Gelber R, Virmond M, Flageul B, Cho SN, Ji B, Paniz-Mondolfi A, Convit J, Young S, Fine PE, Rasolofo V, Brennan PJ, Cole ST. 2005. On the origin of leprosy. Science 308(5724):1040–1042. ^ Kuruwa S, Vissa V, Mistry N. 2012. Distribution of Mycobacterium leprae strains among cases in a rural and urban population of Maharashtra, India. J Clin Microbiol 50(4):1406–1411. ^ Lavania M, Jadhav RS, Turankar RP, Chaitanya VS, Singh M, Sengupta U. 2013. Single nucleotide polymorphisms typing of Mycobacterium leprae reveals focal transmission of leprosy in high endemic regions of India. Clin Microbiol Infect 19(11):1058–1062. ^ Turankar RP, Lavania M, Chaitanya VS, Sengupta U, Darlong J, Darlong F, Siva Sai KS, Jadhav RS. 2014. Single nucleotide polymorphism-based molecular typing of M. leprae from multicase families of leprosy patients and their surroundings to understand the transmission of leprosy. Clin Microbiol Infect 20(3):O142–O149. ^ Myers PZ. 2007. Tandem repeats and morphological variation. Nat Educ 1(1):1. ^ Thomson N, Sebaihia M, Cerdeño-Tárraga A, Bentley S, Crossman L, Parkhill J. 2003. The value of comparison. Nat Rev Microbiol 1(1):11–12. ^ Groathouse NA, Rivoire B, Kim H, Lee H, Cho SN, Brennan PJ, Vissa VD. 2004. Multiple polymorphic loci for molecular typing of strains of Mycobacterium leprae. J Clin Microbiol 42(4):1666–1672. ^ Truman R, Fontes AB, De Miranda AB, Suffys P, Gillis T. 2004. Genotypic variation and stability of four variable-number tandem repeats and their suitability for discriminating strains of Mycobacterium leprae. J Clin Microbiol 42(6):2558–2565. ^ Gillis T, Vissa V, Matsuoka M, Young S, Richardus JH, Truman R, Hall B, Brennan P. 2009. Characterisation of short tandem repeats for genotyping Mycobacterium leprae. Lepr Rev 80(3):250–260. ^ Kimura M, Sakamuri RM, Groathouse NA, Rivoire BL, Gingrich D, Krueger-Koplin S, Cho SN, Brennan PJ, Vissa V. 2009. Rapid variable-number tandem-repeat genotyping for Mycobacterium leprae clinical specimens. J Clin Microbiol 47(6):1757–1766. ^ Lavania M, Katoch K, Singh H, Das R, Gupta AK, Sharma R, Chauhan DS, Sharma VD, Sachan P, Sachan S, Katoch VM. 2007. Predominance of three copies of tandem repeats in rpoT gene of Mycobacterium leprae from Northern India. Infect Genet Evol 7(5):627–631. ^ Sakamuri RM, Harrison J, Gelber R, Saunderson P, Brennan PJ, Balagon M, Vissa V. 2009. A continuation: study and characterisation of Mycobacterium leprae short tandem repeat genotypes and transmission of leprosy in Cebu, Philippines. Lepr Rev 80(3):272–279. ^ Srisungngam S, Rudeeaneksin J, Wattanpokayakit S, Pasadorn S, Tragoolpua R, Suwanrit S, Sawanpanyalert P, Phetsuksiri B. 2007. Typing of Thai clinical isolates of Mycobacterium leprae and analysis of leprosy transmission by polymorphism of tandem repeats. Southeast Asian J Trop Med Public Health 38(4):714–720. ^ Young SK, Ponnighaus JM, Jain S, Lucas S, Suneetha S, Lockwood DN, Young DB, Fine PE. 2008. Use of short tandem repeat sequences to study Mycobacterium leprae in leprosy patients in Malawi and India. PLoS Negl Trop Dis 2(4):e214. ^ Monot M, Honoré N, Balière C, Ji B, Sow S, Brennan PJ, Cole ST. 2008. Are variable-number tandem repeats appropriate for genotyping Mycobacterium leprae? J Clin Microbiol 46(7):2291–2297. a, b Sharma R, Singh P, Loughry WJ, Lockhart JM, Inman WB, Duthie MS, Pena MT, Marcos LA, Scollard DM, Cole ST, Truman RW. 2015. Zoonotic leprosy in the southeastern United States. Emerg Infect Dis 21(12):2127–2134. a, b Truman RW, Singh P, Sharma R, Busso P, Rougemont J, Paniz-Mondolfi A, Kapopoulou A, Brisse S, Scollard DM, Gillis TP, Cole ST. 2011. Probable Zoonotic Leprosy in the Southern United States. N Engl J Med 364(17):1626–1633. ^ Bruce S, Schroeder TL, Ellner K, Rubin H, Williams T, Wolf JE Jr. 2000. Armadillo exposure and Hansen’s disease: an epidemiologic survey in southern Texas. J Am Acad Dermatol 43(2 Pt 1):223–228. ^ Abide JM, Webb RM, Jones HL, Young L. 2008. Three indigenous cases of leprosy in the Mississippi delta. South Med J 101(6):635–638. ^ Thomas DA, Mines JS, Thomas DC, Mack TM, Rea TH. 1987. Armadillo exposure among Mexican-born patients with lepromatous leprosy. J Infect Dis 156(6):990–992. ^ Clark BM, Murray CK, Horvath LL, Deye GA, Rasnake MS, Longfield RN. 2008. Case-control study of armadillo contact and Hansen’s disease. Am J Trop Med Hyg 78(6):962–967. ^ Filice GA, Greenberg RN, Fraser DW. 1977. Lack of observed association between armadillo contact and leprosy in humans. Am J Trop Med Hyg 26(1):137–139. ^ Lane JE, Walsh DS, Meyers WM, Klassen-Fischer MK, Kent DE, Cohen DJ. 2006. Borderline tuberculoid leprosy in a woman from the state of Georgia with armadillo exposure. J Am Acad Dermatol 55(4):714–716. ^ Lumpkin LR III, Cox GF, Wolf JE Jr. 1983. Leprosy in five armadillo handlers. J Am Acad Dermatol 9(6):899–903. ^ Benjak A, Avanzi C, Singh P, Loiseau C, Girma S, Busso P, Fontes ANB, Miyamoto Y, Namisato M, Bobosha K, Salgado CG, da Silva MB, Bouth RC, Frade MAC, Filho FB, Barreto JG, Nery JAC, Bührer-Sékula S, Lupien A, Al-Samie AR, Al-Qubati Y, Alkubati AS, Bretzel G, Vera-Cabrera L, Sakho F, Johnson CR, Kodio M, Fomba A, Sow SO, Gado M, Konaté O, Stefani MMA, Penna GO, Suffys PN, Sarno EN, Moraes MO, Rosa PS, Baptista IMFD, Spencer JS, Aseffa A, Matsuoka M, Kai M, Cole ST. 2018. Phylogenomics and antimicrobial resistance of the leprosy bacillus Mycobacterium leprae. Nat Commun 9(1):352–362. ^ Stefani MMA, Avanzi C, Bührer-Sékula S, Benjak A, Loiseau C, Singh P, Pontes MAA, Gonçalves HS, Hungria EM, Busso P, Piton J, Silveira MIS, Cruz R, Schetinni A, Costa MB, Virmond MCL, Diorio SM, Dias-Baptista IMF, Rosa PS, Matsuoka M, Penna MLF, Cole ST, Penna GO. 2017. Whole genome sequencing distinguishes between relapse and reinfection in recurrent leprosy cases. PLoS Negl Trop Dis 11(6):e0005598. ^ Bos K, Harkins KM, Herbig A, Coscolla M, Weber N, Comas I, Forrest SA, Bryant JM, Harris SR, Schuenemann VJ, Campbell TJ, Majander K, Wilbur AK, Guichon RA, Wolfe Steadman DL, Cook DC, Niemann S, Behr MA, Zumarraga M, Bastida R, Huson D, Nieselt K, Young D, Parkhill J, Buikstra JE, Gagneux S, Stone AC, Krause J. 2014. Pre-Columbian mycobacterial genomes reveal seals as a source of New World human tuberculosis. Nature 514(7523):494–497.